Why Choose Dayton for your Next Sporting Event? Dayton is one of the nation’s Top 10 “90 Minute Markets,” nearly 6 million people can reach Dayton in 3 hours by air or car. Dayton’s track record of hosting successful events is extremely long and impressive. 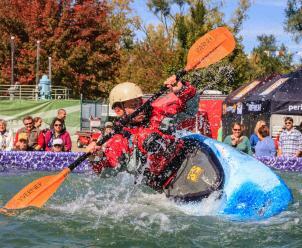 In particular, we’ver become a bit of a Mecca for Youth and Amateur sporting tournaments and events. Soccer, Softball, Volleyball, Basketball, Bowline, Cheer & Dance, Cross County, Marathon, NCAA Basketball, Hockey, Martial Arts, Cycling, Racquet Sports – We’ve hosted them all and more with great success! We would love to add your Special Group to our Roster! And, it is widely varied from youth and amateur sports tournaments, to military reunions, association meetings, religious conventions, education, social, fraternal, government, corporate and hobby groups. You name it, we’ve hosted it! Additionally our success in hosting events is evidenced by the numerous organizations who have opted to make Dayton their permanent home. Hear what other people have said about their success! Success Stories View some of our success stories below, or if you have a Dayton success story you’d like to share, email us today! "After dealing with many housing agencies, I have found the level of service and quality of care given to my athletes by the Dayton Housing Bureau to be second to none! Being the administrator of such a large event, it is reassuring to know my attendees’ accommodation needs are given special attention." “While you will likely receive many qualified offers from competing communities, I can say with complete certainty that you will find success in Dayton." When it comes to getting the most for your money, Dayton is #1. Did you know the cash register was invented in Dayton? Dayton is an affordable city you can’t afford to miss! Come ring up a few good times in our city! Dayton taught the world to fly. Dayton is the Birthplace of Aviation, home to the Wright Brothers, the National Museum of the US Air Force, and the Dayton Aviation Heritage National Historical Park among other sites. Dayton is a progressive city with a spirit of innovation. At the turn of the century Dayton had more patents per capita than any other city in the nation. The airplane, electric car starter, refrigeration, cash register and bar code are just a few of the many inventions from Dayton. The innovative spirit lives on in our community at the Entrepreneurial center and at the Air Force Research Labs at Wright Patterson Air Force Base where the future of aerospace technology is being developed. Event attendees can see and experience the story of the invention of flight in Dayton. Dayton offers unique world-class attractions that can be experienced no where else in the nation or in the world. Many of these attractions are free and offer the perfect entertainment for family members not participating in the tournament of for athletes during their down time. Your event attendees will take away life-changing memories and experiences. Dayton/Montgomery County offers a wide variety of sports facilities and venues appropriate for nearly every type of competition. Please reference the Facilities/Venues section of this website for more detailed information, or contact Ron Eifert reifert@daytoncvb.net. When your sporting event is over, Dayton also offers numerous unique meeting venues for special dinners, off-site activities or awards events. Your group might host a function at scene-75 an entertainment facility with activities ranging from glow-in-the-dark putt-putt, bumper cars, sand volleyball, arcade games, an indoor race track, theatre electronic game rooms to bounce houses. Maybe the citizens motor car company: America’s Packard museum is more your speed or perhaps the beauty of the Dayton art institute’s gothic cloister strikes your fancy. Groups always enjoy a special event under the Riverscape Metropark pavilion along the banks of the Great Miami River in downtown Dayton, or among the nearly 30 historic buildings in the 65-acre carillon historical park. Our CVB staff is eager and ready to assist you with great ideas for customized special events. Dayton offers big city amenities such as a vibrant downtown, world-class arts and culture ranging from the Dayton Philharmonic, the Dayton Opera, the Dayton Ballet, the nationally recognized Dayton Contemporary Dance Company, and the beautiful Dayton Art Institute. The Victoria Theatre Association regularly hosts Broadway shows in the spectacular Cesar Pelli designed Schuster Performing Arts Center. Unique shopping, dining and nightlife options abound. But all of this is coupled with warm and friendly Midwestern charm and hospitality that make our community feel like both a big city and a small town. Your attendees will be greeted with warm welcomes and have opportunities to explore and experience big city amenities. 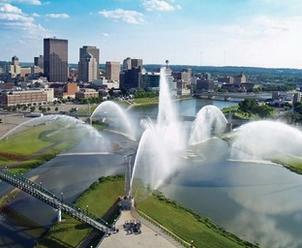 Dayton’s world-class attractions, arts and culture rival those of much larger cities. From the world-renowned FREE National Museum of the U.S. Air Force, the nationally recognized Dayton Contemporary Dance Company, The Dayton Philharmonic, the Dayton Opera, the Dayton Ballet (the nation’s second oldest ballet company), the Dayton Aviation Heritage National Historical Park, Carillon Historical Park, the Boonshoft Museum of Discovery, to the Dayton Art Institute, Broadway Shows, numerous galleries, a professional theatre company, outdoor concert venues, the renowned Five Rivers MetroParks, and amazing visual arts centers, Dayton offers big city amenities to your group. Amenities friends and family can enjoy while your athlete is competing or amenities you can enjoy together between competitions. 10. WE WANT TO HOST YOU! The Dayton/Montgomery County Convention & Visitors Bureau and the Greater Dayton community are eager to host you and your group. You’ll find that your group gets a lot of special attention, is noticed and warmly welcomed in our community. You’re a Big Fish in our Pond so-to-speak. When you meet in Dayton, you’re not just another group lost in the crowd, you receive the special attention you deserve.